Theme the mural was part of a ‘Grey to Green,’ initiative to improve liveability in the alley for local residents and workers. Artistic Coordinator and a short biography: The word “RestART” is a compound of “restorative” and “art” – RestART is an initiative created in 2002 by restorative justice practitioners with members of the VPD Anti-Graffiti Unit. 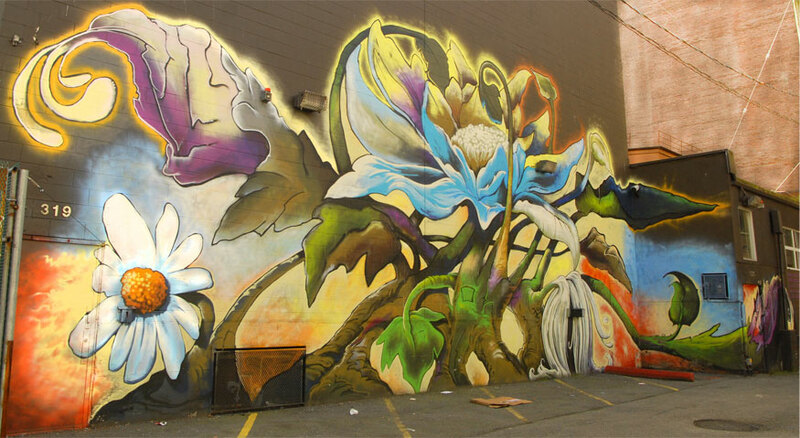 The 319 Main Street mural involved 9 youths and 7 members of community as a team building and skills development component to help beautify and increase the perception of safety in the laneway. Community involvement: RestART & the Grandview-Woodland Community Policing Centre with the support of Great Beginnings and 319 Main Street Holdings Inc.